Some incoming freshmen to Cornell might walk into CHEM 2070 shaking with a bit of fear and trepidation, but not Toyosi Ayanwola ’22. She says she has a pretty good idea of what to expect after taking a chemistry class as part of Cornell’s Prefreshman Summer Program (PSP). PSP, a seven-week program, brings about 180 students to campus each summer – 58 this summer in the College of Arts & Sciences – to take from one to three classes in a variety of subjects, along with a college achievement course that teaches skills to help students transition to the academic world of college. “My first thought was ‘this campus is huge,’ ” said Kemi Adewalure ’22, who’s from Hillside, N.J. The PSP program also includes field trips, guest lectures, community dinners and a wide range of social and cultural activities, along with a thorough introduction to campus, so students feel confident when they return in the fall. 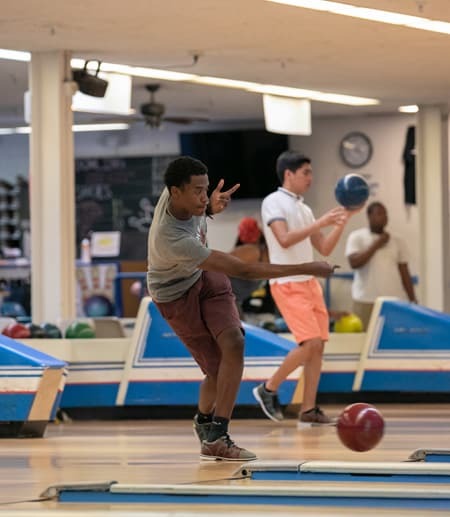 During one of their last days before PSP finals, students enjoyed an afternoon of bowling at Helen Newman Hall. Jessica Velesaca ’22 chatted and hugged new friends in between bowling a few frames. Velesaca said her background in both public and private schools piqued her interest in education policy. She chose Cornell because of the broad curricular offerings in the College of Arts & Sciences. With varied interests including photography, history and economics, as well as education, she’s planning to major in American studies. Adewalure said she’s appreciated the introduction to campus and the chance to wander into offices like the Asian studies program, which is a key reason she chose to come here. “I have a really weird hobby of learning languages when I’m bored,” she said, adding that she knows seven languages including Yoruba and the dialect Ondo, many of which she taught herself by borrowing books and watching YouTube videos. “Sometimes I’d even fake needing a manicure, just so I could go into a shop and listen to the conversation,” she said. Toyosi said she wasn’t thrilled at first about being invited to attend PSP because she was looking forward to a summer with more free time, but along with her chemistry accomplishment, she’s also had time to practice her study skills and develop a great group of friends. Velesaca said she felt a bit guilty being away from home because she’s such a big helper to her mom, but being at PSP has helped her to discover things about herself she didn’t realize, including that she’s not the most organized person and that she loves nature and the calm environment of Ithaca.